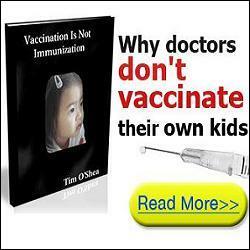 Frankly and demographically, there were no such overtly-cancer-prone statistics about childhood cancers for years prior to the onset of mass inoculation campaigns but, coincidentally, with the rise in vaccines administered at birth and during 2-4-6 month ‘well baby visits’, infants are being inoculated with toxic materials—or should I say “hazmats”—because in order to dispose of vaccines, they must be handled as “hazardous materials,” especially those containing Thimerosal [4,5,6 only a few examples] and disposed of accordingly. So why then do CDC/FDA speak out of several sides of their mouths—or with forked tongues—regarding ethylmercury (49.6%) in Thimerosal as being safe, when vaccines with it cannot be disposed of legally and correctly unless disposed of a “hazardous waste” or “hazardous material”? And yet, the medical profession mandates hazmats be injected into infants whose immune systems are not fully developed. That definitely is a case of “chemical trespass” and should be prosecuted by every Attorney General in every U.S. state and at the federal level—no ifs, ands or buts. The legal charge: Chemical Child Abuse! When will the lawsuits charging “chemical trespass,” chemical assault and battery, and chemical child abuse begin against Monsanto for glyphosate in vaccines? Parents, please don’t be afraid to stand your ground on this one. The 1986 “get out of jail free” law Congress gifted to Big Pharma won’t cover glyphosate issues, in my opinion, since glyphosate is not an acknowledged or deliberate vaccine manufacturing ingredient listed in the CDC’s Vaccine Excipient & Media Summary  or in any vaccine package insert . However, poisonous contaminants should be checked for as part of a manufacturer’s product liability issues, which then falls into the category of defective products legal liability, especially since Big Pharma claims their vaccines are safe! In 2015, the World Health Organization’s International Agency for Research on Cancer (IARC) concluded that glyphosate is probably carcinogenic to humans. The IARC report further concluded that the cancers most associated with glyphosate exposure are non-Hodgkin lymphoma and other hematopoietic cancers. Per the lawsuit, Monsanto continues to proclaim that glyphosate-based herbicides, including Roundup, create no unreasonable risks to human health or to the environment. To prove that Roundup is safe for human use, the lawsuit alleges that Monsanto championed falsified data and attacked legitimate studies that revealed the herbicide’s dangers, while also ghostwriting studies and leading a prolonged campaign of misinformation to convince government agencies and consumers that Roundup was safe. “Monsanto’s newly released documents expose a culture corrupt enough to shock the company’s most jaded critics,” says environmental attorney Robert F. Kennedy, Jr., who is working with Baum Hedlund on the Roundup litigation. Isn’t it high time consumers awaken to how we are being abused [“chemical trespass,” chemical assault and battery] by corporate fiats and, even more profoundly, by corporate- or medical-trades-initiated legislation [e.g., California’s Senator Pan, MD] to take away everyone’s rights to self-determination affecting our lives, health, quality of air, food and water, particularly including those of our children, who will be taken away from parents by Child Protective Services if we don’t kowtow to their poisonous mandates? Where is LEGAL justice? Or, is that why the statue of Justice is blindfolded? Isn’t now the time for legal change? 4 Comments on "Are Monsanto’s Roundup® Legal Nightmares Just Beginning?" It is time to open these cases against Monsanto, and the parents must be represented by The Rainman. It would be nice to round up all the key persons at Monsanto and force-feed THEM with the stuff. When taking into account Kissinger’s “agenda 21” and the synagogue-run U.N.’s 2030 “project”, it doesn’t take a class three patent clerk, (Einstein) to figure out why Monsanto has dubbed their GMO et al as “Non-Kosher”. “selective genocide” anyone?